Innovators at the 2015 Showcase after pitching their clean energy solutions to prospective investors. On Nov. 20, 2015, Powering Agriculture held its Innovator Showcase in Washington, D.C., where the 13 finalists comprising 2015 Innovator cohort were announced. The Showcase featured pitches and exhibits from 23 Innovators across Powering Agriculture’s 2013 and 2015 cohorts, presentations by PAEGC Partners, and a keynote speech from Jehiel Oliver, CEO of Hello Tractor. The innovator showcase brought together investors, accelerators, donors, and technical experts working in the energy/agriculture nexus to discuss how they are addressing global climate change and meeting the need for clean energy in agriculture to feed the developing world. 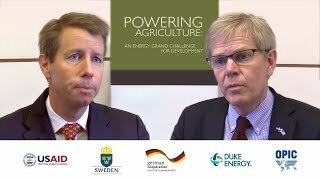 On Nov. 20, 2015, the world met the 2015 Innovator Cohort of the Powering Agriculture: An Energy Grand Challenge for Development program at our Innovator Showcase in Washington, D.C. In this video series, you can hear what they had to say, in their own words. 1:1 Interaction with Powering Agriculture’s Innovators!